Well, I myself didn’t do a ton of Perl hacking, at least in comparison to others in the room. (I did manage to fix up a bunch of my Perl-related bits and pieces for jEdit though.) Here’s a progress report from right before dinner. The folks working on Parrot fixed a lot of tests, and configure.pl, and did a lot of general code cleaning. They also improved the Tcl compiler, checked in Forth, and introduced a bunch of new people to the project. Pete Krawczyk did some work on the long-neglected HTML::Tree, making many miscellaneous fixes and improving Unicode support. Andy Lester made updates to ack. He said his goal is to introduce more of the general public to ack, and make it so that people don’t even realize it’s Perl-based. He wants it to be something people can just drop into their ~/bin directory and use. That’s it for me… Plenty of Perl folks will be here until tomorrow working on moving their projects forward, but I’m outta here. Thanks to The Perl Foundation for making it happen. Krugle is a search engine for code. Ken Krugler (the guy behind Krugle) gave a talk at the Chicago Perl Hackathon about about it, and was looking for feedback and suggestions on how to improve it. And of course, there’s the question of the business model. Ken said they’ve gotten some money from VC‘s, they also show sponsored ads, they’ve got a developer programs, and are working on an enterprise product. Parrot is a virtual machine designed to efficiently compile and execute bytecode for interpreted languages. Parrot will be the target for the final Perl 6 compiler…as well as variety of other languages. I just talked to chromatic about Parrot. 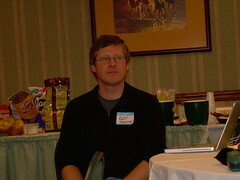 He’s just one of a whole bunch of Perl folks at the Chicago Perl Hackathon working on getting a Parrot release out. They’re working on writing policies right now, so you can choose what tests to run against your code. It’s beyond my coding skills, but it looks like an interesting project. Hopefully they’ll make some good progress this weekend. 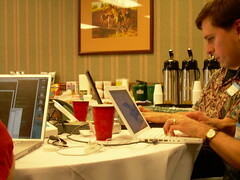 Anyone interested in attending the Chicago Perl Hackathon happening Nov. 10th/11th, 2006?